NT-MDT Spectrum Instruments presents a new developement: MFM cantilevers with CoFe magnetic coating. 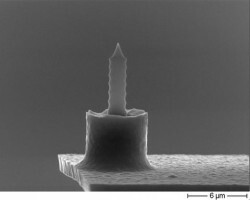 Sharp tip with magnetic layer's thickness less than 30 nm allows to get magnetic contrast with down to 20-30 nm resolution! To demonstrate excellent characteristics of CoFe cantilevers, amplitude-modulation magnetic force microscopy (AC-MFM) measurements of a modern high-density HDD were performed recently by our application engineer. Below the one may find scans obtained and their cross sections. It is noteworthy that such detailed images allowed our engineers to recognize sectors of different functionality of the hard disk investigated (which are mentioned on scans’ captures). To the left - AC-MFM image of servo sector. Scan size: 10×10 μm2 (with 5 nm step), section size: 2,5 μm. To the right - AC-MFM image of user data sector. Scan size: 8×8 μm2 (with 5 nm step), section size: 2,5 μm (section of AGC preamble area) . Standard chip size: 3.6 х 1.6 х 0.4 mm, - makes cantilevers compatible with most of commercial AFMs. Cantilever's material, silicon, is highly doped preventing from static charges' collection. Reflective side is covered by Al layer, enhancing registration signal. Tip side is covered by CoFe magnetic material with an additional layer that prevents from oxidation. Thickness of magnetic layer is around 30-40 nm. Average curvature radius is 35 nm. *by the customer's request cantilevers with different coating thickness could be manufactured. It will change their magnetic moment to fit to different experimental conditions and sample's requirements.